This blogpost was first written in 2011, and has been updated several times most recently in July 2017. The accompanying presentation has also been updated. This original blogpost is still largely accurate. The big 4 changes: include the Enterprise Boards being rebranded as the Local Enterprise Offices while Enterprise Ireland have also rebranded the EPPs as New Frontiers. The scheme formerly known as Seed Capital Relief is now SURE – Startup Refunds For Entrepreneurs. Finally, CSF has also been launched since this post was first published! This article will now address the supports available depending on the stage of development of your startup company: pre-enterprise; early stage; and established startup. In Ireland the bodies who are worth talking to at this stage include the Local Enterprise Office; Enterprise Ireland; the BICs such as WestBIC; Partnerships and possibly the Chambers. Your local bank manager is also worth approaching! The website Smallbusinesscan.ie is definitely worth a visit. Best LinkedIn group is Startup Ireland to compliment their website and offline networking while I also recommend the Startup Digest for an up to date digest of events for Startups in Galway, Limerick, Dublin and/or Cork. And don’t forget to talk to your local Social Welfare Office about the Back to Work Short Term Enterprise Allowance. Other organisations to contact include Social Entrepreneurs Ireland and your local Community Enterprise Centres. • Get Export Ready programme incorporating the FirstFlight Programme. Campus incubation centres such as ArcLabs (Waterford), Synergy Centre (Tallaght) and the Innovation Hubs (iHubs) in GMIT are a great resource to startup entrepreneurs. New Frontiers is Ireland’s national entrepreneur programme located in the Institutes of Technology around the country. The Competitive Start Fund is also relevant at this stage – check out my blogposts on applying for CSF. NDRC @ Portershed is a new programme commencing in Galway in July 2017. The Microsoft BizSpark Programme is also worth investigating. • Use of their information centre. Other finance supports to be aware of are MicroFinance Ireland (previously First Step); Startup Refunds for Entrepreneurs (SURE) formerly known as Seed Capital Relief; and Employment and Investment Initiative (EII)] previously called as Business Expansion Scheme (BES). 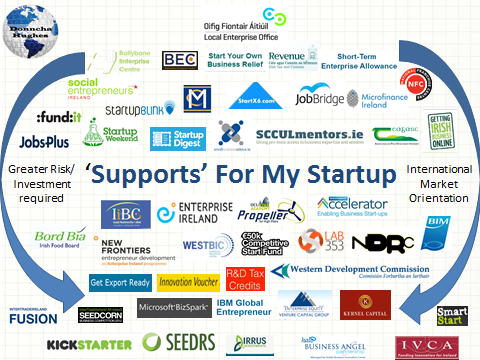 Other organisations to check out include: Enterprise Equity (AIB Seed Capital Fund); Kernel Capital (Bank of Ireland Seed Capital Fund); and HBAN – the business angel network to include WXNW (West by North West) which was established in April 2015; Nucleus Venture Partners; Seedups.com; Fundit.ie; IBM Global Entrepreneur Initiative and the Small Business Advice Programme; Skillnets, Plato, and Supply Network Shannon. BTW, Intertrade Ireland offer monthly regional clinics with Drew O’Sullivan aimed at helping companies seeking equity investment – this would be a good starting point for companies seeking equity investment. My blogpost on crowdfunding might also be of interest. All of the organisations listed in this blog have specific criteria that you should familiarise yourself with before making an official application. I think it is worth contacting them for a chat at an early stage to build a relationship. As always I welcome your comments and suggestions. I would appreciate your help in adding to this list! As for the grants all seems to be at a stand still at the moment. I would agree with your comments talk to all of the agencies about what is really available. However there will be a merging of some kind with all the agencies over the coming months so all systems change. In the current climate if you can get the money form else where then do so. Yes indeed Graham, everyone will be keeping a very close eye on how the new Government decides to support the Enterprise Support Agencies. Great blog Donncha! Well done, looks super. Must get blogging more myself. Thanks for the post mentioning us in Enterprise Ireland. Thanks for sharing that link. It is great to have the information on Enterprise Ireland initiatives, events and supports in the software and services area. Great resource Donncha – thanks for pulling all the information together and featuring HBAN!